No advance reservation required for parties of 10 or less. Marketplace Tasting: Sample five of our highly-rated and estate wines for $20. Are you someone who loves wine, but want to round out your tasting skills? Well then V.Sattui is the right place for you. They have extremely welcoming staff who know how to make you feel at home. They’ll break things down and help you level up on your tasting knowledge. But seasoned tasters shouldn’t shy away whatsoever. If you are looking for a more advanced experience, they’ve got you covered as well. V. Sattui offers one of the broadest portfolios of wines in Napa Valley so they’re able to satisfy even the most obscure pallets. What sets V.Sattui apart is that it’s one of the first Napa Valley wineries to sell exclusively direct to consumer. This means customer service has always been at the core of their business model. And as I mentioned, this definitely shows. Equally noteworthy is their large tasting room. In fact it’s one of the largest in Napa Valley and boasts an incredible deli. This makes it the perfect destination for larger groups— especially those that bring their appetite. We definitely recommend hitting the deli. Pick from their hundreds of cheeses, grab some bites, and enjoy some glasses on their outdoor picnic tables. Imagine sipping your wine among lush greenery or next to a peaceful fountain. The outdoor areas are unforgettable! This is why it’s always on the top of the list when it comes to Picnic Friendly Wineries in Napa. We do have a few forewarnings though. V.Sattui is quite popular (for many of the reasons listed above). So that said, you may want to hit this spot during the week or before peak hours. Better yet, bring a picnic blanket and find a nice spot on their wooded lawn. They don’t allow outside foods/drinks, but you can find all you need inside their tasting room. 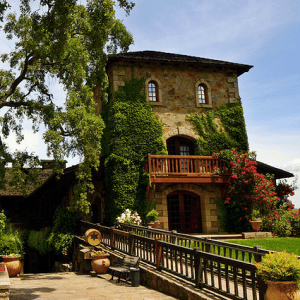 Regardless V.Sattui is an iconic hotspot that makes our list of the best wineries to visit in Napa Valley.